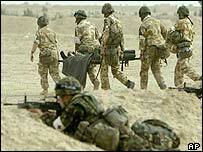 British forces are ready to support Iraqis who rise up to overthrow Saddam Hussein, the prime minister has said. Tony Blair spoke as UK troops remained outside Basra, where he said there had been "some limited form of uprising". But as coalition troops fired on Iraqi militia and soldiers reportedly fleeing the second city, Defence Secretary Geoff Hoon conceded the situation inside it was "unclear". A reporter in Basra for Qatar-based television station al-Jazeera said "there are no signs of the reported uprising", while Baghdad dismissed claims that a rebellion was under way as "lies" . Raising humanitarian concerns, the Red Cross aid agency said it had been unable to get medical supplies to Basra's wounded civilians and that only half of the city's water supply was working. Two members of a UK tank crew were killed by so-called 'friendly fire' during battles on the outskirts of the city - home to about 1.5 million people. Facing questions from MPs on the progress of war, the prime minister said any offer of help to rebels would be decided by commanders on the ground. He said it was essential not to encourage uprisings to take place too soon. "We've got to be careful we know we have the support in place, [and are] able to help them before we encourage them to do things that may lead to their death," he said. 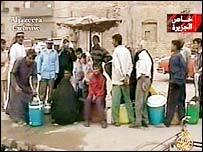 But while the extent of the reported rebellion remained uncertain, Mr Blair said it was absolutely clear that Iraqis would "opt for freedom rather than repression" once they knew Saddam Hussein's rule was coming to an end. Iraqi positions in Basra were attacked following reports that Iraqi soldiers had turned their guns and mortars on people involved in an uprising. Mr Hoon said "efforts have been made to reduce the numbers fighting against their own people". British reporter Richard Gaisford, who is embedded with UK troops on the edge of the city, said a 2,000lb precision bomb attack destroyed the Ba'ath Party headquarters. He said: "It went straight through the ceiling, went through and destroyed the whole building and really nothing of it at all is left in the middle of Basra, we are told. The two buildings either side remained intact." British forces spokesman Group Captain Al Lockwood told BBC Radio 4's Today programme that before Basra was entered commanders would look "very, very carefully at all options available to us". One unnamed British officer said the decision was taken to not go into Basra overnight because of fears that civilians could be mistakenly hit in any fighting. It is thought that commanders are concerned that many soldiers could be disguised as civilians and that street to street fighting could see many casualties. 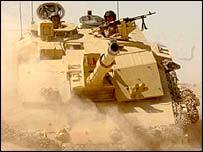 The Royal Scots Dragoon Guards are among those forces on standby to enter the city. "The heavy armour is just waiting here, ready to go if the generals and the brigadiers and all those military top brass decide to send them," Mr Gaisford said. Iraqi Information Minister Mohammed al-Sahhaf denied that any revolt had taken place in Basra. "The situation is stable. Resistance is continuing and we are teaching them more lessons," he told al-Jazeera television. Iranian radio said coalition efforts to encircle Basra had failed after heavy resistance from Iraqi forces. In separate exchanges, two British soldiers from the Queen's Royal Lancers were killed and two seriously injured in a "friendly fire" incident on the outskirts of Basra. Mr Hoon said: "This was another tragic incident. It appears that in the heat of battle, when one tank was coming under attack, it turned and fired on another tank, and sadly another tank was also a British tank." "The battle for Basra goes on"